PHUKET: Prime Minister Gen Prayut Chan-o-cha has issued a public statement thanking all parties involved in the recovery of the last body from the Phoenix tour boat disaster – but also called for officials to ensure that all types of travel are standard and safe. PM Prayut highlighted the efforts of the international team, and noted the importance of holding cremations of the victims as quickly and as appropriately as possible in accordance with surviving family members’ wishes. He also highlighted the importance of making sure any compensation payments were made with as little bureaucratic delay as possible. PM Prayut also urged all parties to learn lessons from the incident, and cited specifically as example law enforcement in the inspection of ships in relation to safety standards. “In this we must do everything strictly and continuously, not only after such an incident, to provide tourists with confidence,” he said. "We must solve this problem to impress upon and reassure tourists (of their safety), but in the long term all types of travel businesses must be genuinely safe – boats, planes, buses, vans, taxis, all aspects of transport in Thailand – to make this a destination of good tourism standards,” he said. 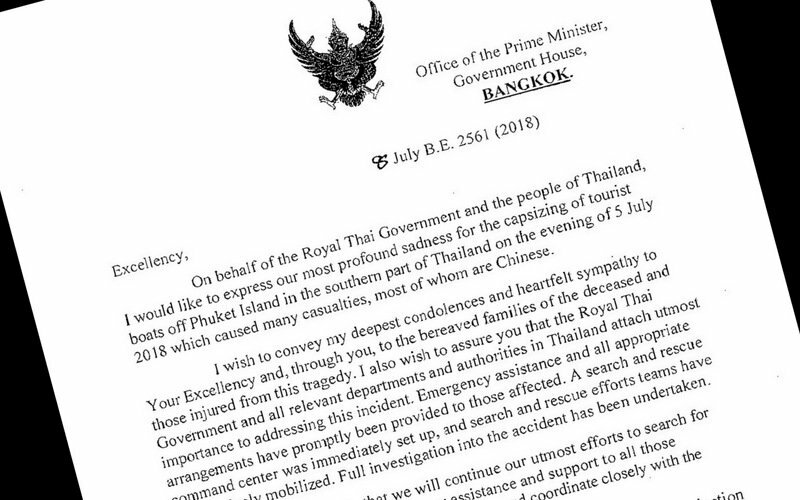 PM Prayut’s statement today follows closely his message to Chinese President Xi Jinping on July 8 offering his deepest condolences for the disaster, which killed 47 Chinese tourists. In that letter, PM Prayut noted, “Please also rest assured of the Royal Thai Government’s determination to do (its) utmost to prevent recurrence of similar incident involving any tourists and visitors in the future. Does general Prayut not have  a public relation team to keep him on right publicity track? All the time he makes the people laugh about him. In Thailand and abroad.